So, in the meantime, I’m behind on my reading. Paul Auster’s The Invention of Solitude came in early for tomorrow’s book discussion group at the library, and I finished the first part on Friday night, but haven’t picked it up since. The first half “Portrait of an Invisible Man,” was simply beautiful, and I love how the pages yellowed in my copy. And some interesting marginalia—interesting to compare how readers respond: even when one is clearly responding to an assignment. Free notes! Then again, I have been knitting. I finished the back of my first top. Casting on for the front took all weekend, because I couldn’t remember the cast on I used (knitted on, I think it’s called). I also finally started Susie Roger’s Reading Mitts, which has been in my queue since before the first version was taken down. I’m using the yarn my mom bought me in Maine. A pretty light green, with colorful flecks, called Lena’s Meadow. I can finish the thumb, I have to learn yet another cast on. 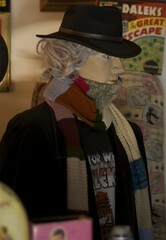 I even got through another few inches on my brother’s Dr. Who scarf: only about 15 feet to go! My current obsession with White Collar has helped my knitting a lot. Really clever themes and character growth, and simply the best relationship on television Peter and Elizabeth Burke. It’s sad how few shows can manage even a decently healthy relationship for one episode, but theirs is real and, as El said, “we work” (because real relationships aren’t easy). Also, despite what the fangirls think, the best part of the show is Neal’s growing up. I’ve rewatched most all of the four seasons since just this weekend, which has given me lots of finger-free time. Now if only I could figure out a way to read and knit at the same time I’d be all set—and probably caught up with both. (I have no idea how this is related, but WP thinks so. Also, so what? Babies don’t need a moral compass, because they aren’t in any position to make decisions period. Kind of by definition. Just say’n.